Jon Bohmer, a Norwegian living in Africa with his family was looking for a simple project to do with his two little girls - he came across a green living contest and won it! He saw first hand people living near water they did not boil before consuming and people who walked miles for firewood. He also saw humans deforesting large areas of Africa and knew their had to be a better way to get people to boil their food/water and reduce our carbon footprint on this earth. The population in Africa and 3rd world countries is also skyrocketing and industrial nations are flat - something needed to be done to stem the tide of deforestation and many human health issues of drinking unsterile water. 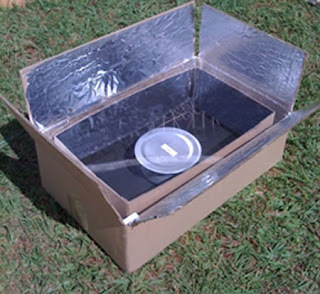 Jon Bohmer and his girls invented a cheap, solar-powered cardboard cooker for rural Africa called the "Kyoto Box". They named the box the Kyoto-box after the Kyoto green treaty. Did you know, that over 1/2 of the human population on planet earth still uses fire to cook with - imagine an 80-year old woman with 44lbs of firewood on her back walking 5+ miles!? This invention can help prevent two tonnes of carbon dioxide emissions per family per year and preserve trees. It consists of two cardboard boxes with an acrylic cover. This allows the sun’s power to come in and not leave. A layer of straw or newspaper between the boxes provides insulation, while black paint on the interior and the foil on the exterior help in preserving the heat. It boils water in 3-5 minutes depending on the strength of the sun. The Kyoto Box costs just $5 and can be produced at any cardboard factory. Also, in the cards are a more durable model made from recycled plastic that costs the same to manufacture. The main aim of this new solar stove is to reduce health problems in the rural villages while avoiding carbon dioxide emissions - 2.5 million of these "Kyoto boxes" are in production in a Kenya factory right now. Hooray!